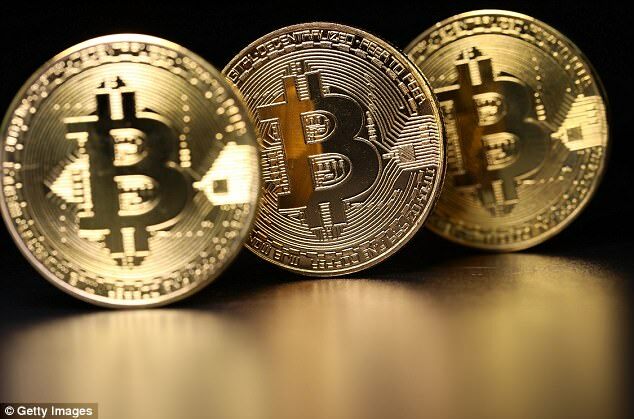 Bitcoin plunged as much as 15 percent to below $14,500 (£10,740) on Friday, after briefly hitting a new record of $17,000 (£12,600) earlier this week. After a dive to $14,480 (£10,725) in Asian afternoon trading, BitCoin clawed back some ground and stood at $16,100 (£11,930) at 8.30am GMT. It has soared more than 50 percent in just a week and is up from a 2017 low of $752 (£557) in mid-January. The explosive rise in its value has now surpassed even the 'tulip mania' of the 17th century, when the flowers were at the centre of a huge financial bubble, The Times reports. During the tulip bubble, vast stretches of land and other traditional assets were traded for bulbs in a craze that lasted until its dramatic collapse in 1637. But the New York company Convoy Investments has now shown the value of a bitcoin has grown more rapidly over the last three years than the price of a tulip did in the three years preceding the flower crash in the 17th century. He also told Bloomberg that central banks are 'anxious' about bitcoin. Another man warning about the currency is Robert Shiller, a Nobel prize-winning economist. But Shiller also said that the currency is 'not totally crazy', explaining that it is a 'new technology' with 'the same mystery of value as real money, and real money persists'. The combined value of all the world's bitcoins last night was estimated to be about $270billion (£200billion). But worries that a bitcoin crash will wreck the global economy have been dismissed by central banks around the world - including the Bank of England. NiceHash, the firm that had millions of dollars of bitcoins stolen yesterday, did not say themselves how much was stolen but users shared the company's wallet address on Twitter which showed it had 4,736.42 bitcoins. The company has reported the incident to police and told users to change their passwords. Bitcoin has long been a target for hackers. In 2014 almost a million bitcoins - worth around $700million at the time - were stolen from Japanese bitcoin exchange Mt Gox, rendering it bankrupt. Before the hack, NiceHash had been suffering problems, with many bitcoin owners posting panicked comments on its social media accounts. It came after the price of bitcoin surged to over $14,100.74, gaining $1,000 in less than a day. It is now over $17,000. That compares with a value below $1,000 at the beginning of the year. Bitcoin is the world's most popular digital currency. Such currencies are not tied to a bank or government and allow users to spend money anonymously. They are essentially lines of computer code that are digitally signed each time they are traded. Miners of bitcoins and other virtual currencies help keep the systems honest with a blockchain, a global running tally of every transaction that prevents cheaters from spending the same digital coin twice. NiceHash is a cryptocurrency mining application that matches those with spare computing to power to miners wanting to create new coins.